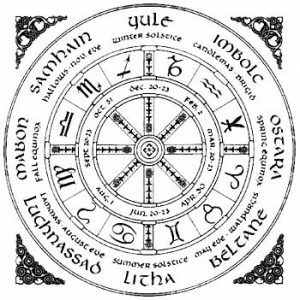 The Celtic calendar is a collection of systems for keeping time and was used by Celtic countries to denote the start and duration of the day, week, month, seasons, the quarter days, and the festivals. The Celtic people looked at time differently than people today. For the Celts, time was circular and not linear like today’s widely-accepted Gregorian method. These ancient people started their day and every festival at dusk instead of dawn. In this particular calendar, the year began during the Samhain (October 31), wherein nature seems to wither. Thus, the Celtic year’s first month is called Samonios or ‘Seed Fall,’ which means from darkness and death springs light and life. The cycle of festivals is considered the ancient calendar’s most exciting aspect. Through the festivals, people can bring a sense of continuity and rhythm to their lives by observing and celebrating these occasions. The Samhain, which the Celts celebrate every October 31, was the time when they believe that the veil between the Otherworld and the world of the living is thin enough for the dead to return. During Samhain, wars were stopped until Beltane. The modern Halloween is derived from Samhain. Every January 31, which was also lambing stage, the Celts celebrate the Imbolc, a festival that marks the start of winter’s end. Women gathered to celebrate the return of the Goddess’s. Imbolc was also the period for lambs to be born, as well as a time to eat a dish made from the lambs’ docked tails. This festival in the Druidic calendar was celebrated during May 1. It signified the abundance of fertility. It was a time for fairs and feasts, for animals to mate, and even for divorces (which may have arisen from trial weddings conducted during Lughnasadh). Beltane is the forerunner of May Day celebrations like maypole dancing and the Padstow Hobby Horse, which are still celebrated in certain rural areas. This two-week long summer festival that falls around July 31 is celebrated with horse-racing competitions. There was also horse-trading during the festival. This festival was linked to Macha, the fertility goddess. Just as Chinese astrology is associated with the lunar calendar and Western astrology is associated with the Gregorian calendar, They had also practiced astrology through their tree approach to measuring the year and this is based on the idea that the time of a person’s birth will affect that person’s behavior and personality formation. Although not thoroughly proven, the Celtic astrology system stemmed out of a natural connection with the Celts’ earth cycle knowledge and the Celts’ honor for trees’ sacred knowledge. The Druids may have believed that trees were vessels and carriers of infinite wisdom. While the Druidic calendar is no longer widely used in the modern world, some Neo-Pagan religions do use them for ritualistic purposes. Those who practiced Neopaganism also celebrate the Samhain, Imbolc, Beltane, and Lughnasadh. Even people who are not adherents of Neopaganism may apply the principles in how they approach to their daily lives. People can try to become aware the change is constant and that seasons change. People can also observe the festivals in their own way by attuning their lives to changes in the seasons. Samhain can be a good time to start new projects and Beltane can be a good period to start projects that require energy and courage. The calendar may still serve as a guide for people who attune themselves with the seasons, the solar cycle, and the lunar cycle.